Modern approach in the organization of lighting in the home can be considered a use of LED lamps, which have their advantages and disadvantages. This product is a set of parameters. They have an impact on the level of power consumption, cost of production, comfort lighting and other qualities. That is why you should know that, how to choose the right LED lamp and what features have different versions. An important indicator for buyers when choosing any type of lamp power was always. That power has an impact on the economy organized lighting, and the degree of ambient light. Value for money and saving on lamps. It only remains an important issue as LED lamps? Many decide to choose LED lamp for an apartment on the grounds, that of incandescent lamps consume 5 times more electricity. This feature is, that the usual option to 75 W can be replaced with LED power 5 W.
Power is ideal for home lighting from 6 to 8 W. This range is considered to be analogs of conventional 60-watt light bulbs. 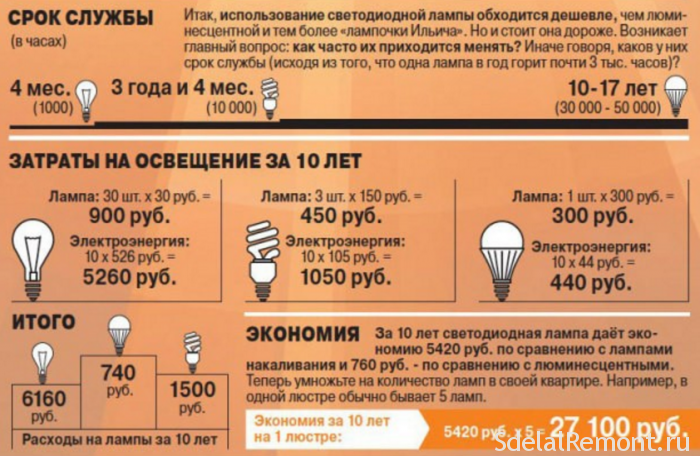 The recommended rate of voltage for LEDs 12-220 AT. light bulbs, working with a smaller voltage indicator, They are used in environments with high humidity index, for example, in the bathroom. Reducing the operating voltage indicator does not reduce the amount of energy consumed. Responding to a question, how to choose LED lamp power, should take into account the regularity: variant tungsten filament consumes 5 times more energy. 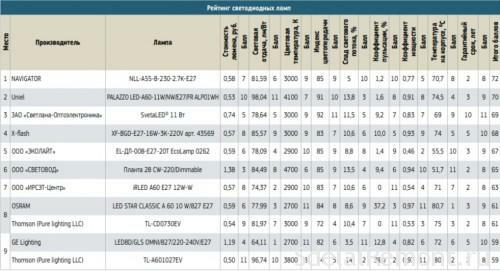 How to choose a LED lamp of the subject index? According to the options best suited to statistics conducted by Housing execution, which have a yellowish glow. Often on the box indicated similar color as "warm white" or "soft white". But for office and industrial premises accepted to buy with bright daylight. As incandescent lamps, LED have different types of base. Many chandeliers have E27. Spotlights have a socket GU 5.3. The wall sconces and bedside lamp used thread E27 and E14. Additionally the shape of the light source can be very diverse: from the standard to the embodiment of the pear-shaped or spiral shapes. Mounted radiator conducts cooling structure due to exhaust heat from the heating elements. If there are types of LED lamps for the home, which do not have cooling system in the form of an aluminum surface with ribs, something similar to the embodiment should get round. In some cases, instead of aluminum used plastic. This is done to reduce the cost of production. However, pay attention to such a decision, when the cooling radiator made of plastic, Also, do not. This is due to the fact, that is much lower thermal conductivity of plastic, in a strong heat it melts. Frosted glass, which is often used in the manufacture of, It does not allow to understand, whether there is a construction of the cooling radiator and of what type. Therefore, these options are not worth buying. When choosing LED lights many are interested in the, how much it can work. Through LED lamp choice for home, worth remembering, that products from reputable manufacturers will last about 50 thousand. hours. However, modern diodes is one feature - with time they work performance deteriorated, luminescence quality significantly decreases. When you purchase should clarify the time warranty for these products. The warranty period is about 3-5 years old. warranty type, which applies to the products in question, It provides for its replacement in case of failure. 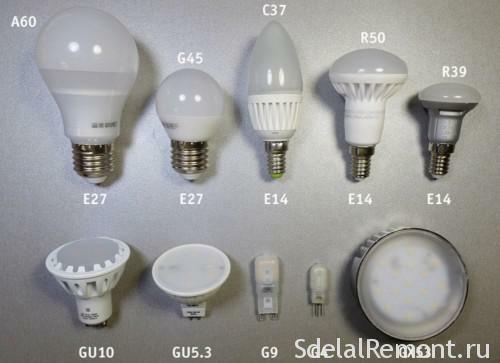 domestic manufacturers of LED lamps for the home rarely give a guarantee for more than 3 years. During this period, there are no breakages. However, there are manufacturers, and which does not give a guarantee for the products. Such variants should get round. An important selection criterion may be called light scatter angle. At the wrong choice of this parameter lighting efficiency is greatly reduced. Light incidence angle 300 - focused version, which has all the diodes, disposed in one plane. Most suitable for table lamps. Light incidence angle 600 - the most common form of execution, which is installed in chandeliers. Such an angle allows you to choose products with the most optimal power, and since power is increased with increasing dispersion index angle for improving the degree of ambient light. Light incidence angle 900 - in this case the LEDs are arranged in different planes and form a plurality of rows. It applies provided illumination of large spaces, when the light source is very small. Because of the strong scattering have more power. If you decide that, some LED bulbs better for the house according to the classification considered above, consider the number of lighting points, their purpose, height placement. The best option - a light incidence angle 600. Information about the firm, which carries out production. operating life, which confirmed warranty. Colour temperature, which affects the color of light. If some information is not, this phenomenon can be considered as an indicator of low quality products. It is for information drawing on packing the consumer to hold elections. Marking LED lamps It does not reflect their basic qualities and, often, carried out by the manufacturer of products for internal accounting. Besides, when you select should pay attention to the assembly: if there are large gaps, irregularities or external defects - such an option should not buy. In details the quality of LED lamps. on, which company is the manufacturer, It depends on all of the above features. It is important to note, that foreign and domestic manufacturers produce mainly high-quality products, but still rated LED lamps for home on this indicator has. Quite a lot of positive feedback can be found on the company's products MAXUS. They give the greatest warranty period for your lamps at a relatively low price for them. 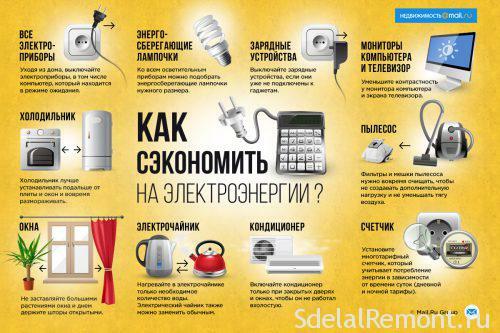 Among domestic manufacturers attention deserves the company "Svetlana-Optoelectronics" and "OptoGaN". 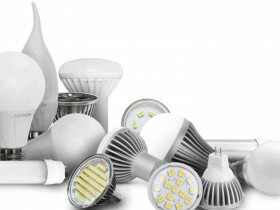 Know the ordinary LED lamps are not designed for dimming and do not work with dimmers. For this purpose, use a different type of lamp. Important indicators, which rarely pay attention, we refer light transmission rate and compatibility with dimmer. conducted tests LED lamps for home show, that the color rendering index should be at least 80 for bright. The highest rate can be considered 95, but these versions are very expensive. check the, as high-quality products produced under consideration producer, you can compare the performance of light transmission rate and the cost of: if it is high, and the product price is low, then it is a fake. Dimmer - a device for modulating the light level in the room. For such a system produces special LED lamps. If the purchase option, which is not intended for use in this system, the regulator and the LEDs will break down quickly. With lamps considered is getting more popular, that can be attributed to a permanent increase in the price of electricity. That is why the number of fakes on sale is constantly growing. When you select should use the above advice and then buying a product which will last for many years. The main question remains is the reliability of LED lamps, it is recommended to watch the video, thanks to which you'll be one specialist.